My intern demanded that if I were to justify her labor, she should learn a thing or two, so we made dinner together last night. I had a 3.5 pound brisket in the freezer from Edgar (the grass-fed cow I split with friends) and she was craving mashed potatoes, so this is what we whipped up. The whole meal was made with one pan and one bowl, so she wouldn’t have too many dishes to do. Season the brisket all over with kosher salt and fresh ground pepper (we used about 1 tablespoons each) and refrigerate for at least an hour. Set the oven to 350 and deal with peeling your veggies and cutting them into 1-inch pieces. In a large, oven-safe pan, simmer the wine and bay leaf over medium heat until the liquid is reduced by half. Discard the bay leaf, and add worchestershire sauce, and stock. Pour the liquid into a non-reactive bowl and set aside. Return the pan to the stove, add 1 tablespoon vegetable oil and turn up to high. Remove the brisket from the refrigerator and dust with flour. Once the oil is shimmering and nearly smoking, seer the meat for 4 minutes per side, until well browned. Remove the pan from heat, lift the brisket with a pair of tongs and pour the pearl onions and garlic into the roasting pan to form a single layer and then place the brisket on top. Pile the remaining veggies around the brisket and pour in the wine sauce. Cover the pan (foil is fine if it is too tall to put a lid on it) and put it in the oven until the meat it fork tender, about 2 hours. Remove the brisket to a board to rest for 10 minutes. 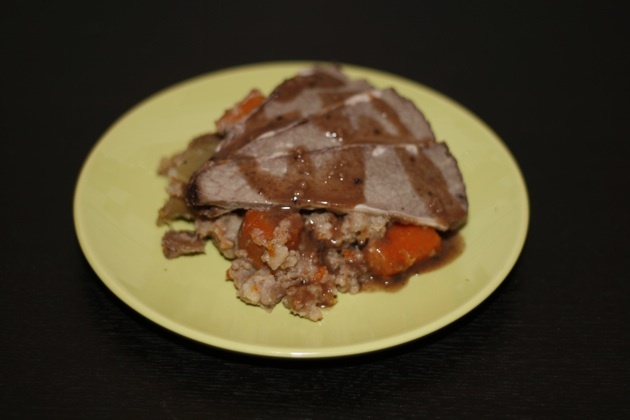 While the meat rests, pour off and reserve the roasting liquid and mash the vegetables in the pan before plating (For gravy, return 1 pint of cooking liquid to the pan with a tablespoon of butter and a pinch each of basil, oregano and thyme. Return to a simmer and whisk in 2 tablespoons flour, simmering 7 or 8 more minutes, skimming off any foam that rises to the top. Season with salt and pepper as needed). 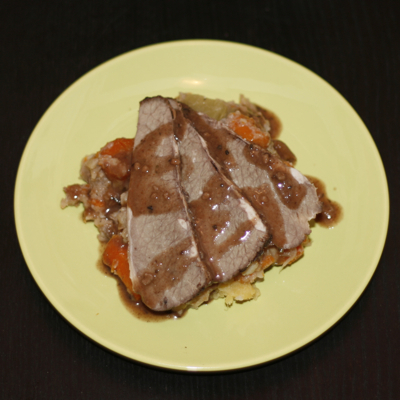 Plate a flattened scoop of mash, topped with fanned slices of brisket, drizzle with gravy and garnish with fresh thyme. I got great feedback on these meatballs yesterday, even from professional chefs who asked me about technique and seemed impressed, and one gal told me she loved them because they reminded her of her mother’s home cooking in India. I thought I would share the recipe. It makes a big batch, but they freeze well. Blend shallots and garlic in food processor until nearly a paste but still chunky. Saute shallots and garlic in bacon fat for five minutes, until soft, but don’t allow to brown. Add spices and stir for a couple minutes to make a paste. Allow to cool for a few minutes so it doesn’t cook the eggs, then stir in syrup and eggs and then bread crumbs. Incorporate thoroughly into the lamb and refrigerate one hour. 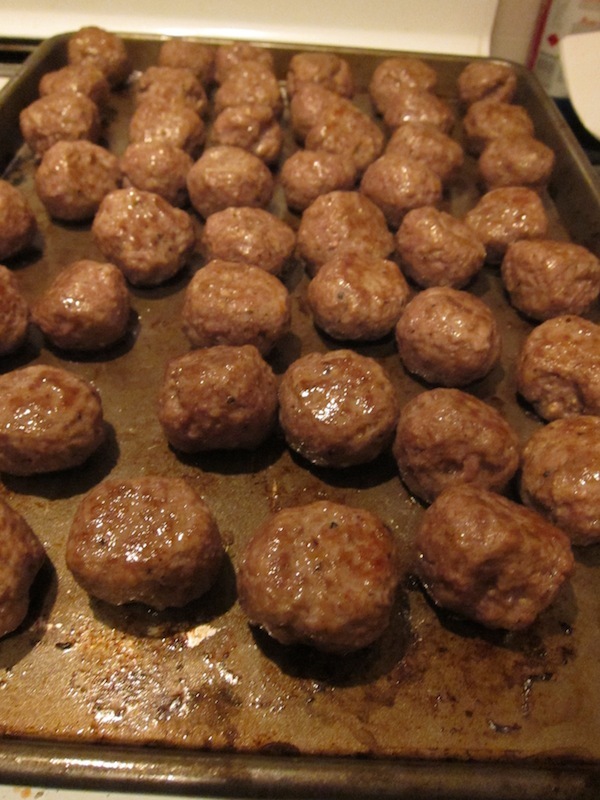 Preheat oven to 375 and split the meat into 6 equal pieces, split each of those into 4 equal parts and then quarter those quarters and pack each into a sphere (Note, after the first few, you will get a sense for how the proper size feels in your hands and you can add from bigger ones to bolster the smaller ones). Arrange on two sheet pans and bake 12 minutes, flipping once half way through. 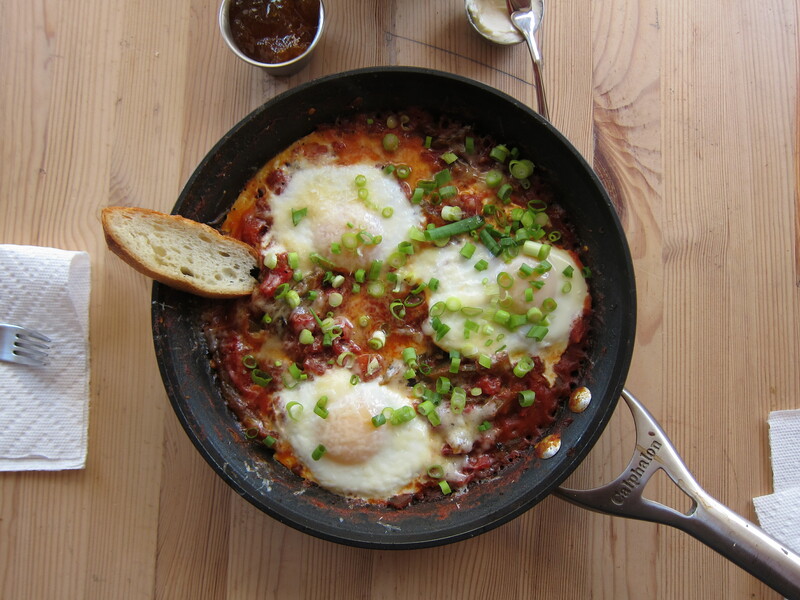 Shakshouka is the Israeli equivalent of Huevos Rancheros or the Turkish dish Menemen. 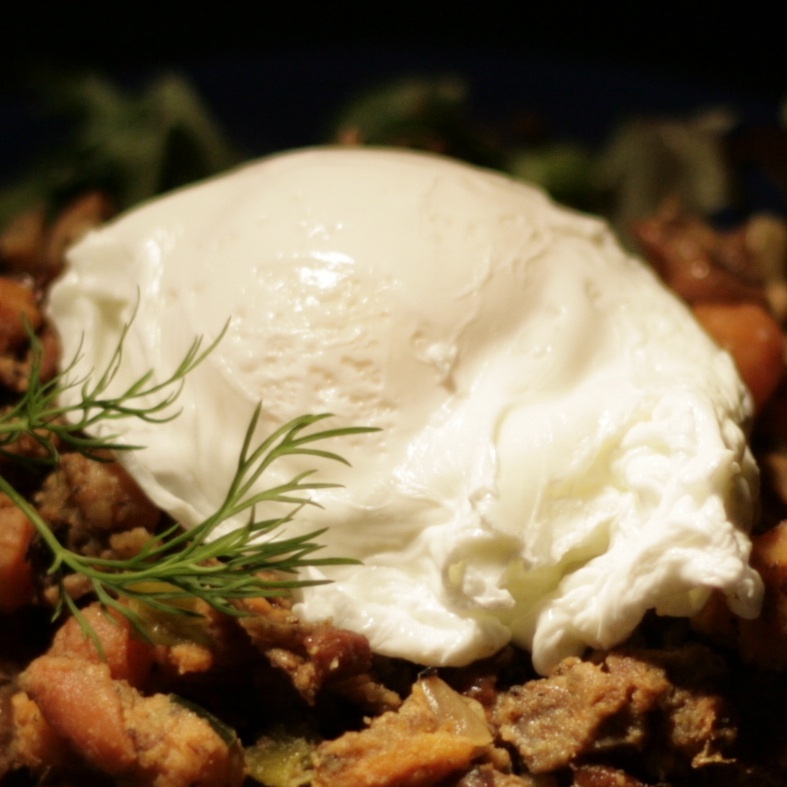 Here’s my take on the theme, which makes an amazing, complete breakfast that will impress. 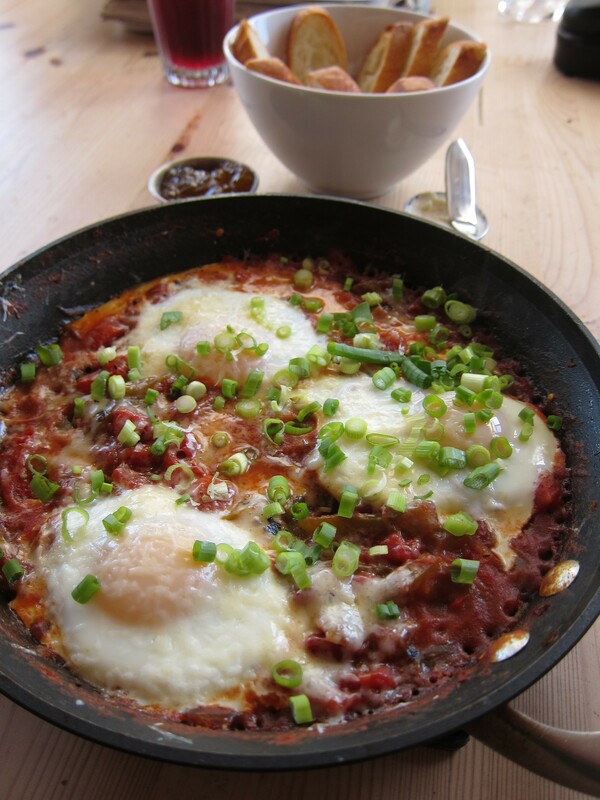 If you are expecting a date to end after breakfast, or you are having someone over for brunch and would rather hang out over coffee than over the stove, you can make this dish the night before, then just reheat it, crack in some eggs and toss it in the oven for a few minutes. This dish is also great because you can make with just one pan, one knife or a mandolin and one spoon. 1. Add the oil to an ovenproof skillet and cook the onion and garlic over medium heat until the onion becomes soft and translucent. Add peppers and cook for 2 minutes. Add the paprika, red pepper flakes, cumin, sugar and bay leaf and cook, stirring occasionally, until fragrant, about 2 minutes. 2. Add the tomatoes to the skillet and bring to a simmer. Reduce the heat and simmer, stirring occasionally, until the tomatoes break down, about 20 minutes. Discard the bay leaf and season with salt and pepper to taste. 3. Preheat oven to 400. Bring the sauce back to a simmer on the stove (this would also be a great time to toss in some chopped up, cooked bacon, if you’re into that sort of thing), then crack the eggs over the sauce and transfer the pan into to the oven and bake until the egg whites are set but the yolks are still soft and runny, about 7 minutes. 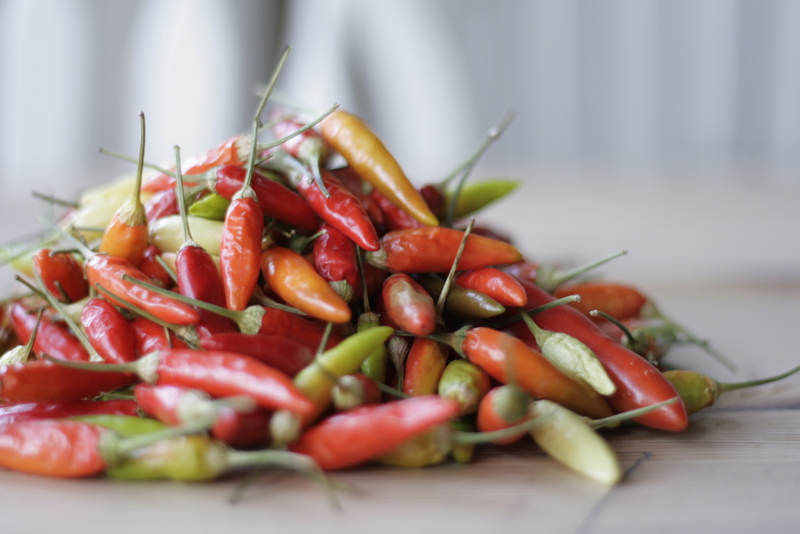 Garnish with cheese and scallions and serve immediately with crusty bread for dipping. Note: To roast peppers, hold them with tongs over the flame on a gas stove until black and blistered on all sides, then rub off the skin under cool tap water. A colleague asked me sheepishly for recipes the other day because, she admitted, she doesn’t know how to cook meat. I was shocked, because she is an amazing baker, and I have had many tasty delights created by her hand. I am starting off with a foolproof steak procedure. It’s hardly a recipe; there just isn’t that much to it. 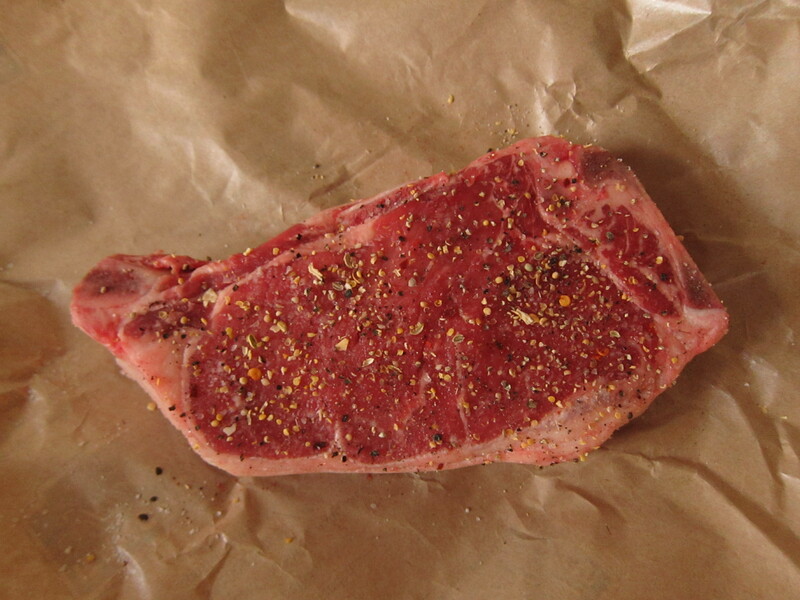 Sprinkle both sides with salt (twice the amount you would expect) and fresh cracked pepper. 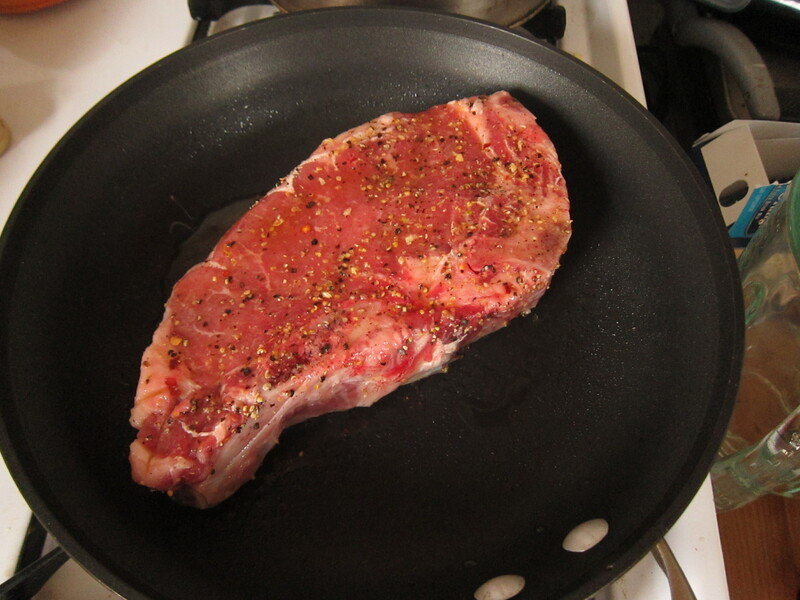 Get a skillet flaming hot while you olive oil both sides of your steak. 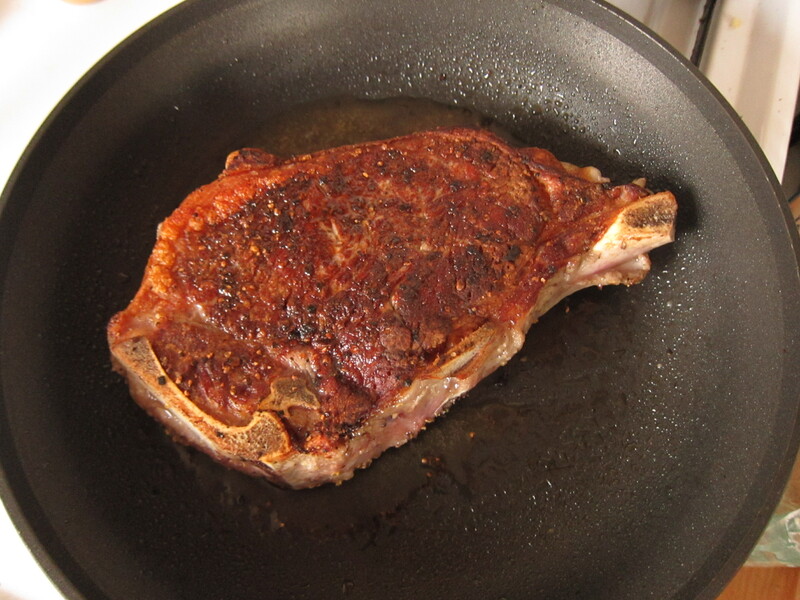 Put the steak in the pan, prettiest side down and sear for 4 minutes to get a great crust. 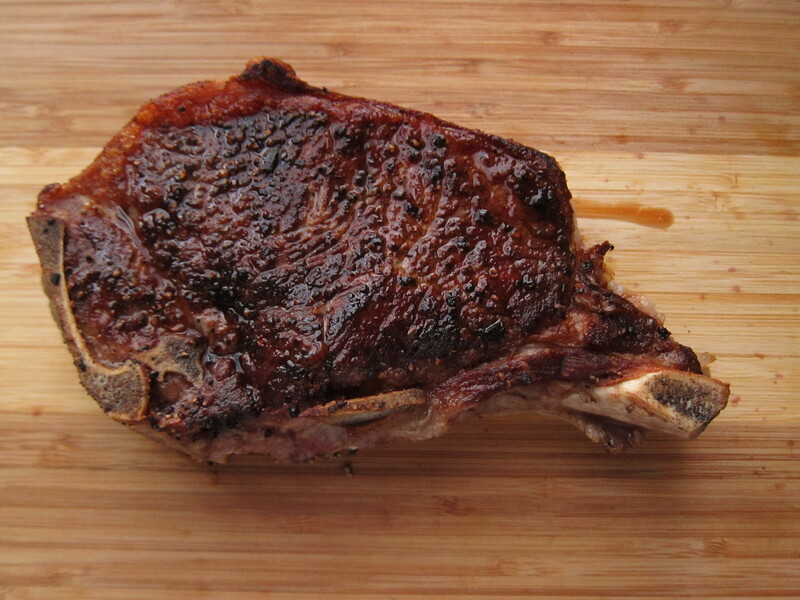 Flip the steak, sear another 4 minutes and remove to a plate to rest for 10 minutes. After stealing two sips of a friend’s Ramos Gin Fizz at Rickhouse, I wanted to make my own. It’s one of those drinks that you don’t order just anywhere and it’s rarely worth the effort to make unless you are really trying to impress someone. Combine all ingredients but soda and shake with ice for 2 minutes. Strain into a collins glass and top with soda water. 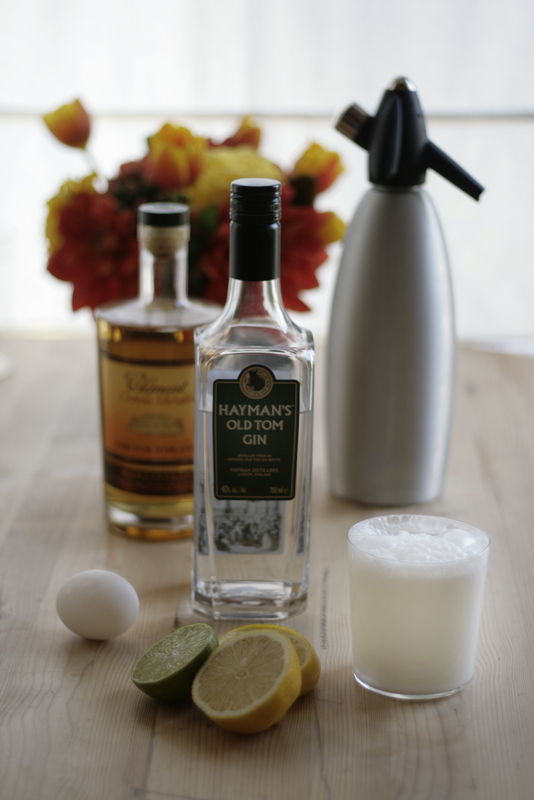 When making the Ramos Fizz for others, use a three-piece shaker instead of a Boston shaker, because nobody wants to see the cream in their cocktail curdle with lemon juice in glass. Using a soda siphon enhances the drink aesthetically, because adding soda under pressure allows you to create a bubbly head on the drink that simply pouring soda will not allow. Lacking a siphon, you can use a trick I learned from mischievous students when I was teaching middle school. Poke or drill a hole in the cap of a plastic soda water bottle and squeeze it into the glass in a sharp stream to froth the drink. The traditional recipe calls for orange blossom water, but it is absurdly hard to find outside of the middle east, so Clement’s Creole Shrubb, or another orange liqueur, such as triple sec, Cointreau or Grand Marnier, can be substituted as above. Alternately, rosewater can be used. Drop the spring from a cocktail strainer into the shaker and shake before adding ice and shake again to expedite the emulsification of the egg white. If you don’t have an Old Tom gin, use a regular London Dry gin like Beefeater and add a barspoon of sugar. I just found out that it’s National Oyster Day. Pairing drinks with food may consider the flavors, smells and even textures of a dish, but rarely the motion involved in its consumption. Pairing shots with oyster shooters is a great way to enhance the sensory experience, and to move the accoutrement off the oyster and into a glass. An for those of you who don’t like oysters, just remember that taking a shot first makes anything more palatable. 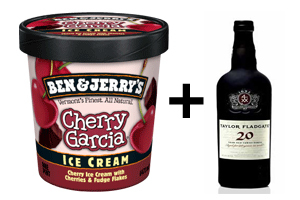 As promised, I bought an ice cream maker and started concocting my boozey Vice Cream. The first batch is fantastic. deep-fried two kinds of cheese-stuffed squash blossoms (chevre and mascarpone) with 4 dipping sauces (southwestern salsa, spicy tomoato, lemony aioli and a green onion sour cream). For years I’ve been making cocktail ingredients at home. I’ve mentioned some favorite infusions and liqueurs, including roasted ginger vodka, chipotle tequila, firewater, pumpkin pie spiced rum and kumquatcello, but I have also been making sweeteners, including grenadine, flavored syrups and marmalades, and novelties like dried bing cherries reconstituted in port. I’ve been wanting to make aromatic and potable bitters, but I haven’t gotten around to procuring the obscure ingredients. Most recently, I remembered an experiment from my college days, dissolving a bag of gummy peaches in cheap peach schnapps, making a sweet, peachy goo that dissolved well in other things. A month ago, I bought 5-ounce bags of Haribo Peach Rings and Fizzy Cola and dissolved each in a cup of vodka. 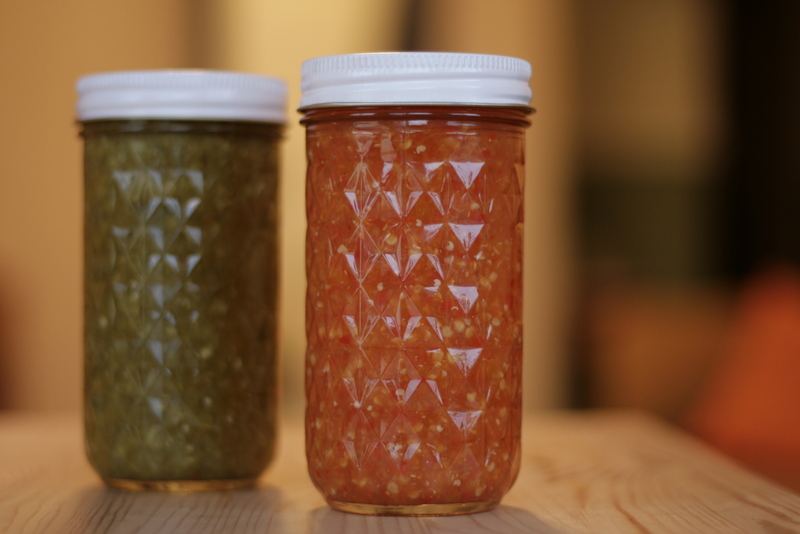 After a couple weeks, both batches had reached an oozy equilibrium, but I haven’t concocted any good uses for them yet. 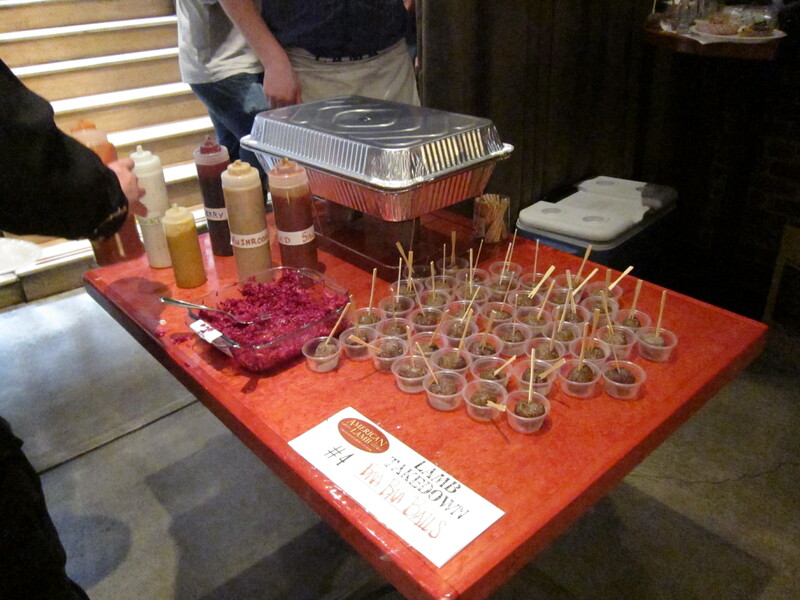 The latest trend according to GQ is Liquid Smoke, which is simple to make, but a slow, involved process. As far as I am concerned, liquid smoke is already a common cocktail component called BOURBON. –Smirnoff has an incredibly clean flavor, great for infusing, and is not an expensive vodka. 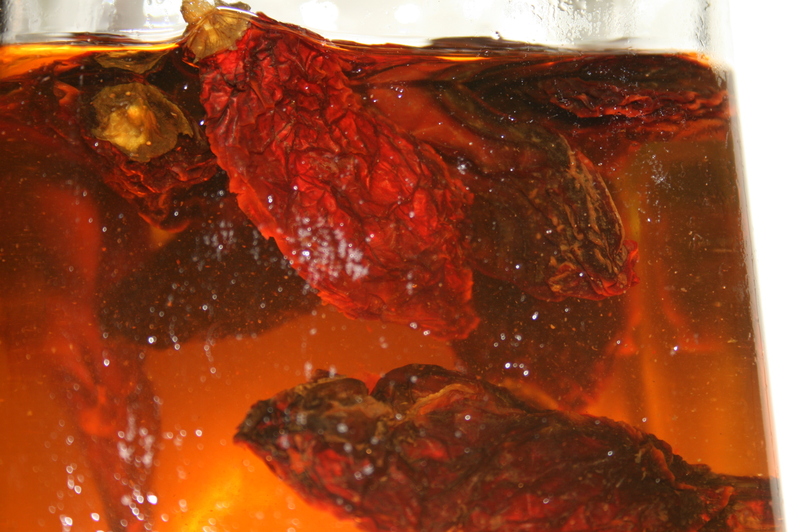 -With tequila, only use 100% agave, even if you are infusing with something strong. It makes a difference. -If an infusion is too strong, spicy, sweet, etc., decant some and dilute that with more booze until the levels are right, and keep track of the measurements so that you can repeat. Don’t just keep adding more booze to the original infusion. -Interesting glass vessels with tops or corks can do double duty as decoration while their contents mingle. -If you are experimenting with ingredients that may not infuse at the same speed and desired intensity, infuse smaller, separate batches of each and combine teaspoonfuls to get the balance right before mixing the whole batch. -Dried fruit infuses better than fresh fruit. Water is the infusion killer. -When infusing with herbs, bruise leafy herbs before adding, but insert woody herbs unharmed. 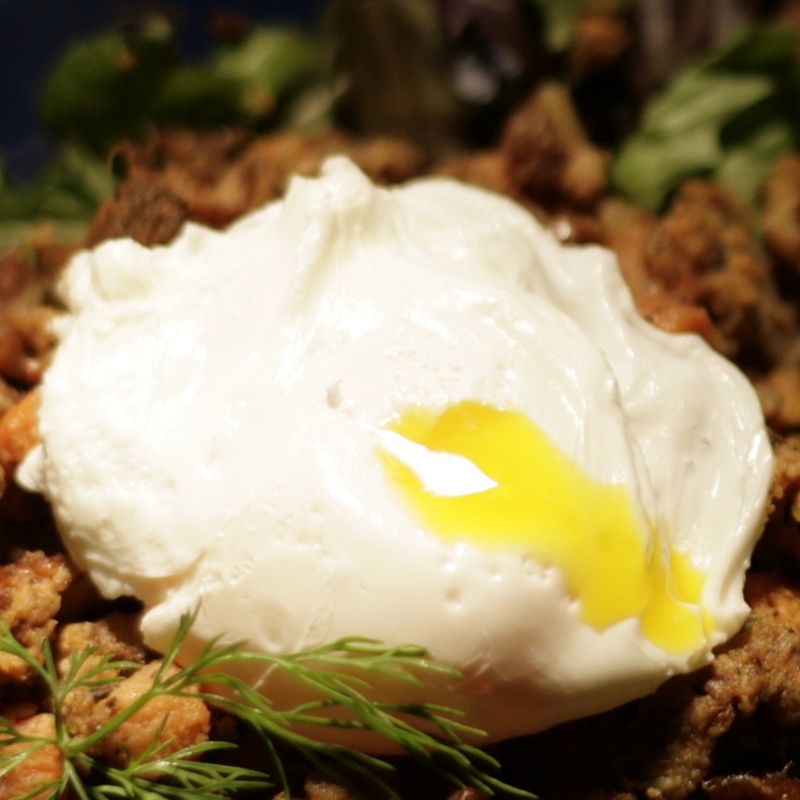 What’s The Big Deal About Poaching An Egg? I keep seeing articles in (otherwise reputable) food blogs on the controversy of poached eggs and the difficulty of making them. It’s like arguing about how to pick your nose: anyone can figure it out and ultimately, you do it however feels best. I find it easiest and most reliable to bring 2 inches of water to a gentle boil, add a tablespoon of vinegar, crack the eggs directly into the pot and don’t touch it again until they are done. I’ve never had one come out badly.